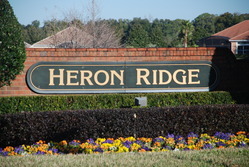 Heron Ridge is a neighborhood located at the far northeast end in the prestigious gated and guarded community of Heathrow Florida. When entering Heathrow via the north guard gate – the gate located at 46A and Orange Avenue- it is the first community on the right. It can be accessed by taking either of the first two right turns once you’ve come through the guard-gate station. Heron Ridge is a 124 home planned neighborhood originally developed and built out in the early 2000’s by Morrison Homes (now Taylor Morrison). The homes are 3, 4 and 5 bedroom models with two and three car garages and all have tiled roofs. Sizes range from approximately 2100 to 3300 sq feet under air and many have pools. In addition, many homes in Heron Ridge back up to one of three lakes located throughout the neighborhood development while others are on a gently sloping hillside at the very north end of the neighborhood. The current price points range from $350,000 to $500,000 depending upon size, location and upgrades.